Taking out an MCA can lead your business into a dangerous death spiral. A merchant capital advance (MCA), also called a merchant cash advance, is not considered a loan, but rather an advance based upon future revenues from credit card sales a business produces. Essentially, a business sells a portion of their future credit card revenue sales to acquire capital immediately. A merchant capital advance lender will ask a business to produce their last 3-5 months of credit card revenues to determine what the business is eligible to receive as an advance. Usually these advances are very attractive to small business owners because they are unsecured loans that fund very quickly. However, it is very important that a small business owner knows exactly how these advances work prior to applying for one. First, an agreement is made between the business and lender on the advanced amount (amount of money the borrower will receive) and the payback amount (amount of money the borrower must payback). It should be noted that capital advances have a significantly higher cost of capital associated with them than traditional bank loans. The borrower will typically pay at least a 25%-40% premium on the amount borrowed. The lender will have access to the borrower’s merchant account for daily ACH drafts to pay back the advance. Each business day, the lender will withdraw either a percentage of daily sales or, more commonly, a set monetary amount regardless of what sales are that business day. The ACH drafts will continue until the advance is paid in full. 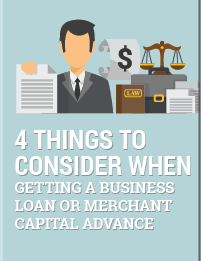 You can read more about the terms associated with Merchant Capital Advances here. Unfortunately, the cash advance industry has a reputation of being extremely aggressive when collecting from cash advance clients who have defaulted on their payments. In addition to large default penalties, most cash advance lenders who require a Confession of Judgment prior to the advance work quickly to file their COJ and freeze their clients bank accounts upon default. Once the client’s bank account is frozen, all money in the account will go toward satisfying the judgment amount. This amount does not only include the principle balance, but also any default fees, interest and attorney fees. Depending on the advance company, freezing a client’s bank account can happen in as little as two business days after default. The cash advance lender will also file a UCC financing statement against the borrower that gives them a security interest in company property (and personal property when personal guarantees are given), which they can execute on upon default. Furthermore, it is becoming more and more common for lenders to allow clients to take out additional advances prior to paying the first advance off. This is commonly referred to as “stacking.” Many small businesses will take out numerous advances at one time without thinking about the financial burden the repayments put on the company which can very easily lead to a death spiral. If you find yourself falling behind on your cash advance payments, you need to be proactive and address the issue immediately before aggressive collection efforts start. Fuselier & Associates Financial has extensive experience dealing with cash advances and can help your company get back on track, regardless of whether you are just starting to fall behind on payments or are currently in a capital advance death spiral. Contact us today for a free consultation and to learn about how we can help your business.